When you think of border wars you think of two countries going at each other, but not in the case of Carowinds in the Carolinas. Carowinds theme park is very rare in the fact that the border between North Carolina and South Carolina goes right through the middle of the park. The park is actually located in Charlotte, NC, but also is located in Fort Mills, SC. The park had its fair share of problems in the planning stages and is actually supposed to be much more than it currently is. After a visit to Disney in the 1950s, Earl Patterson Hall was determined to build a resort style areas on the border between to the two states in hopes to bring the states closer together. Hall envisioned that it would not just be a park, but also a resort area with hotels, shopping centers and a pro football stadium. All of this was shot down with the oil crisis in 1973 and the theme park was the only thing that came out of the vision. After the park was built, it had declining attendance and in 1976 the Carowinds corporation was forced to sell the park to Taft Broadcasting. Taft Broadcasting invested a lot of money into the park before the eventual transfer to Paramount and Viacom in the 1990s. Paramount came in and changed many of the ride’s names which many were upset about because of the use of Carolina in many of the names were now gone. The park was built on the principles of the Carolina’s as evident in the name. The name Caro and Winds was all about the winds that blew across both states of Carolina. Paramount eventually faded and in 2006 the park was acquired by Cedar Fair Entertainment. One of the first things that Cedar Fair did was change the names back to the originals on most of the rides and allowed the culture back into the park. After Cedar Fair took over, they put some money into the park and started to get people back. The park is a great place for the family as well as the coaster enthusiast. The park boasts 10 roller coasters that include some of the best in the country. 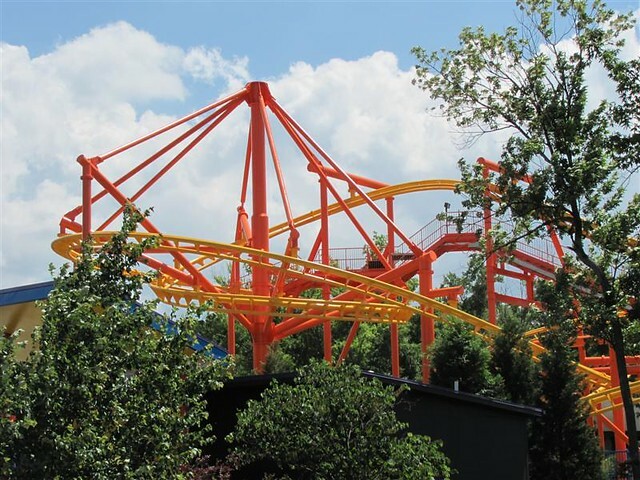 One coaster that many are raving about is the B&M invert known as AfterBurn. The park recently added a B&M hyper coaster called Intimidator that stands out at the front of the park. If you like to stand up or lie down and fly, there is a big assortment of coasters for everyone. Next time you are in the Carolinas, cruise on into Carowinds where the winds will always blow in your favor.